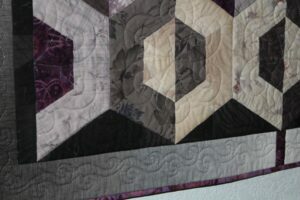 This quilt top was pieced in 2011 and I started my blog in 2012, so this is the first blog photo of the Gray & Purple Hexagon quilt. It shrunk an 1″ with the machine quilting and now measures 38″ x 48″. I am so happy with the machine quilting on this quilt and – as you can see – all the chalk washes away. 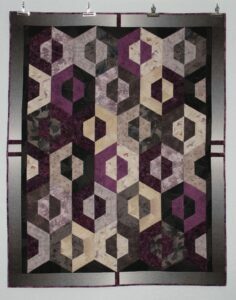 My 2017 goal of 25 finished quilts is on track with Gray & Purple Hexagon as my 14th finish. Next up is Long Time Gone. The plan is to start the machine quilting by the end of the week, so I had better get started on the quilt sandwich.